We're convinced that digital radiography makes for fast and easy evaluation of even the most complex dental conditions. Add to this its very minimal use of radiation (as much as 90% less than traditional x-rays) and you get advanced diagnosis with superior safety. The instantaneous, clear computer image produced by the digital x-ray allows us to immediately discuss the findings with our patients. We can examine the outer and inner structures and tissues of each tooth, as well as the surrounding roots, root canals and bone. What may have previously been mysterious and frightening is suddenly rendered reasonable and non-threatening. On the spot we're able to clearly and simply explain all the steps of any recommended restoration procedures. And because it helps our patients clearly understand the root issues behind their dental health, we're able to work together to determine the very best treatment options for each case. Open Wide & Say "Aha!" People seldom have a clear idea of the actual status of their dental health. Even with lights and mirrors, it's tough to see anything but the front of your own teeth, or segments of the shadowed backs and side areas. Intraoral cameras have changed all of that. Now you can sit back comfortably while Dr. Palmore or one of our hygienists inserts a pen-sized camera-tipped wand into your mouth. The wand simply takes a video of the inside of your mouth and transmits the images to a computer monitor. Aha! In an instant, we can all view your photos and review every last detail of your oral health. It’s not necessarily pleasant to come face to face with your own dental condition. But it's important to do so for several reasons. First, the camera may reveal the early stages of potentially serious problems, helping you make an informed decision about your treatment options. This is especially helpful with gum disease and other conditions where the pain is a latent indicator of a problem. Second the camera's honest survey can show in a moment how well you're doing with your regular home hygiene. This helps you and your dentist realistically assess what steps you might need to take on your own to improve things. Every cavity starts small. The DIAGNOdent® laser scanner accurately locates cavities in their earliest stages when they are most treatable. Dr. Palmore is excited to offer this innovative technology. DIAGNOdent uses harmless laser light technology to relay detailed information about the enamel surface, as well as examine grooves, fissures, cracks and other difficult-to-see areas. When used with standard dental instruments and X-ray technology, the DIAGNOdent is proven to be 90% accurate – uncovering decay often missed by conventional examination methods. In addition, we can use it to monitor the progression of cavities over time with precise and reliable measurements. The small, portable DIAGNOdent makes for quicker, more comfortable exams. After getting a baseline reading using one of your healthy teeth, the laser light is quickly and painlessly moved throughout the mouth. During this process a numerical reading is displayed next to the healthy baseline number. Potential problems are indicated by changes in the numbers – prompting Dr. Palmore to restore “trouble spots” early, and prevent future discomfort, expense and damage to the tooth. Treatment success is all in the details. Dr. Palmore uses magnification to help improve oral health assessment and esthetic smile enhancement. Eyeglass-supported loupes magnification allows Dr. Palmore to diagnose more precisely and accurately. He uses loupes to detect imperfections and flaws that can harbor disease. Dr. Palmore is able to find small pits and hairline cracks in your teeth that could become future cavities or breakage. With the help of efficient overhead lights, he can powerfully illuminate every nuance of artistic smile design. Loupes, similar to what jewelers use, detect problems and imperfections that the unaided eye cannot. Expect to get the look and health you expect and need after this careful examination and Dr. Palmore's recommended treatment. It is difficult to change our habits even if our current habits are not so bad. Dr. Palmore's team knows this and respects where you are at in your oral care. We begin your care at that point and help you pursue newer, healthier goals. We offer all the preventive services every dental practice does plus the most advanced methods in a very comfortable environment. Whether you have been to the dentist every six months for your entire life or have not been to a dentist in many years, expect an awesome experience and even better health. Gum (periodontal) disease has been linked to heart attacks, stroke, and low birth weights. This serious oral disease is also the leading cause of tooth loss in adults. Gum disease is the leading cause of adult tooth loss, 30-50% of Americans have some form--many do not know it. Ultrasonic Cleanings: This treatment painlessly disinfects your gums and your mouth, removing disease harboring tartar and underlying bacteria. We can often stop gum disease in its tracks with this advanced method of treatment. Root planning and scaling might also be necessary depending on build up and disease progression. Here is another source for background on the gum disease. Link to heart health. Clean, fresh breath and health are very often interconnected. Bacteria in your mouth have the potential to cause disease. Without some form of regular hygiene therapy, the bacterial residue will cause bad breath. Actually nine out of ten times bacteria is the reason for smelly breath. Our hygienists have many ways to virtually eliminate the potential for serious oral damage from uncontrolled bacteria growth. Beyond saving your teeth from gum disease, the benefits of regular oral treatment are fresher breath and a healthier, even longer life. Here are two we use in office and are also available for home use. Breath treatment with CloSYSII and Tooth Gum Tonic: These are alcohol free oral rinses. They freshen breath while effectively controlling the growth of harmful bacteria. Tongue Scraping: This plastic scraping device removes harmful bacteria from the surface of the tongue and can be used everyday. The tongue scraper we offer has a lifetime warranty. Read Gum Disease Prevention for more targeted treatments. During this hour one person will die from oral cancer in the U.S, about 8,000 people per year. That is more than those who die from melanoma (7,000) or cervical cancer (5,000). Regular visits with Dr. Palmore's team put you in control of your oral health (and help keep negative statistics in boring research articles where they belong). Unfortunately, a small white or red spot can turn into this life threatening disease. Cancerous and precancerous spots or sores can look like harmless spots or sores also found in the mouth. However, these seemingly harmless "spots" can be very serious, so an oral cancer screenings should be performed to make sure there is no disease present. Those who smoke and/or consume large quantities of alcohol are at the highest risk for getting oral cancer; on the other hand many who get oral cancer have had no obvious risk factors. 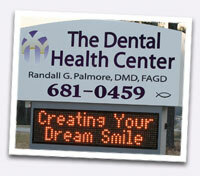 Dr. Palmore and his team are dedicated to optimal oral health. Oral cancer screenings are done regularly using the Vizilite System to detect early cell changes. Protect your family, protect yourself and live life fully! Attention to cleanliness and your safety is a primary goal. You deserve an environment that is not only kept clean and neat, but where the latest in antiseptic techniques are practiced. When you see the doctors and staff wearing gloves, masks, and eyewear, this is only a small part of the extensive overall effort we make to provide you with a health care environment you want and expect. Dr. Palmore and his staff use the CleanTech 400 hand washing system, which provides up to six hours of antimicrobial protection. CleanTech is unique in look and effectiveness. As one of the first in Alabama to have it, we encourage you to check it out and all the exciting technology we use to improve your dental care. Our sterilization and disinfecting techniques are thorough and meet or exceed all state and national guidelines. Instruments are kept in contaminate proof cassettes and are ultrasonically cleaned, rinsed, steam sterilized and sealed in protective bags until used. Everything else is disposed of properly.